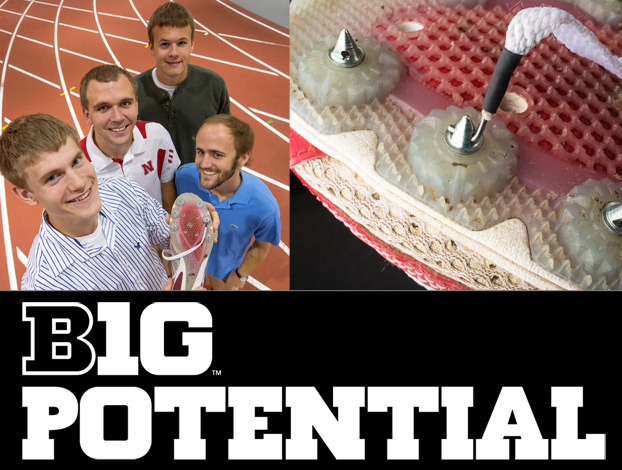 If necessity is the mother of invention, then track athletes who also are engineering students will look for a solution to a perennial problem: The difficulty in changing the small metal spikes on the bottom of their running shoes. University of Nebraska-Lincoln mechanical engineering major Alex Adams developed a new spike-changing system that helps wearers more easily remove and tighten the tiny screw-in pieces. His invention has led to the start of a new venture, Blue Inventor LLC. He's chief executive officer, and three UNL student colleagues are also involved in the startup business: Walter Bircher of Omaha, Shawn Bernard of Benkelman and Chauncey Thomas Brinn of Otsego, Mich.
Adams, of York, is a junior and a former Husker athlete. His invention includes the modification of traditional spikes in two ways to create a product called the TiteSpike. He first added thread-locking technology to prevent spikes from falling out during competition. His second adaptation was a "through hole" in the TiteSpike to aid spike insertion and removal using the TiteSpike Wrench, another patent-pending creation by Adams. The small wrench is fused to a shoelace tip so it won't be misplaced or lost. Traditional spikes can stick in a shoe's threads and ruin it, Adams said. Yet the mechanics of spikes' insertion and removal basically hasn't changed for decades. "Spikes cost pennies, but they have great effect on a track athlete's performance, especially at higher levels of competition," Adams said. Blue Inventor LLC worked with NUtech Ventures, the nonprofit organization responsible for building partnerships between the University of Nebraska and the private sector. NUtech Ventures filed patent applications on behalf of Blue Inventor LLC and connected the startup with potential business partners to manufacture and sell TiteSpike. Adams began working on his invention with UNL's Advanced Surgical Robotics Lab during summer 2011. While using lock nuts for a lab project led by engineering professor Shane Farritor, Adams said he realized this mechanism could be adapted to change track spikes. This spring, Adams took the College of Engineering course, Entrepreneurship for Engineers, co-taught by Farritor and David Conrad, executive director of NUtech Ventures. Class sessions prompted Adams to refine the Tite Spike design, and he then completed an Entrepreneurial Boot Camp offered by NUtech last May. "NUtech would like to work with more students like Alex," Conrad said. "People often hear startups and licensing and think only of faculty researchers. In reality, students and postdocs are critical components of an innovation ecosystem, and can help make UNL's culture more entrepreneurial." Adams said he and his partners are grateful for the advice and mentorship. "The UNL resources and courses helped me to keep things simple and focus on the product's usability," Adams said. NUtech Ventures also connected him with another mentor: UNL alumnus Kim Blair, founding director of the Massachusetts Institute of Technology's Center for Sports Innovation, who offered additional sports business advice. Adams' brother, David -- a UNL electrical engineering graduate who competed in the 2012 U.S. Track and Field Olympic Trials in Eugene, Ore. -- inspired the TiteSpike inventor to send his products with Husker Olympians to the London Games. Blue Inventor LLC also obtained approval from three international organizations for use of the TiteSpike in London -- the International Association of Athletics Federations, the International Olympic Committee, and Mondo, a track surfacing company. Adams has done his own machining and testing on a small scale for the TiteSpike and TiteSpike Wrench, and is deciding whether to attempt licensing his products or to scale up production with U.S. manufacturers. He also offers the TiteSpike and TiteSpike Wrench to runners through the Lincoln Running Co., the UNL Athletic Department and area high schools.